What Happens to Food After the TSA Confiscates it? Ever wondered what happened to your customs-confiscated jamon serrano? Brace yourself: the truth is hard to bear. 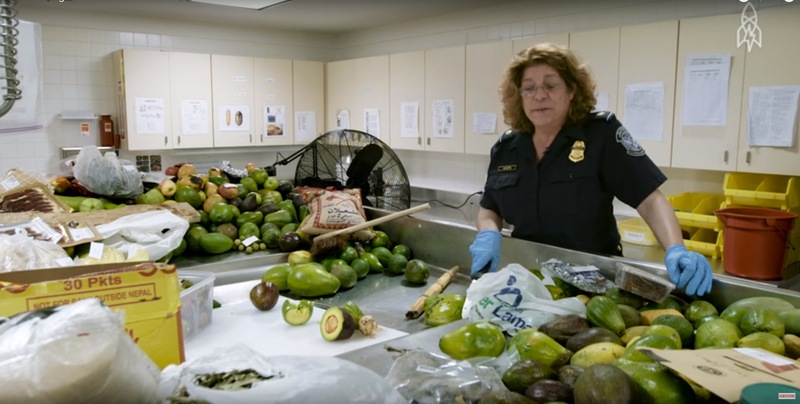 According to a new behind-the-scenes video by Great Big Story, those illegal imports end up in the hands of agents like U.S. customs supervisor Ellie Scaffa, who personally sorts through—and ultimately disposes—up to 600 pounds of fruits and vegetables a day per terminal at New York’s JFK Airport. “I’ve been threatened with my life,” she says about her efforts to protect American agriculture from threats like Chinese beef candy, Jamaican mangoes, or peppers from Guyana. And no, she doesn’t get the privilege of eating your epicurean souvenirs, as many travelers might suspect. All confiscated goods—whether they be shrink-wrapped Swiss Gruyère or fresh rambutans from Thailand—get manually inspected for bugs and parasites, dumped into a contraband bin, and ground up in a supersized InSinkErator, where they meet their ultimate death. Just do us a favor—don’t get caught with the really good stuff. Watching beautiful cured meats go down the drain might be the finest example of a first-world problem, but it still comes with its fair share of heartbreak.